Alex is a Law Professor working at Keele University in the UK (2004 -), holds an adjunct Chair at Queensland University of Technology (2014 -) and is a door tenant at Garden Court Barristers Chambers, London (2016 -). She previously taught at Macquarie University, the University of Sydney, the University of Western Australia, the University of East London and the LSE. She is a social and legal theorist, legal historian and gender, sexuality and law scholar and activist. 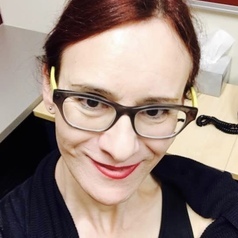 She has been writing about transgender/law issues for over twenty years and is the author of over 60 publications on the subject including her monograph, Transgender Jurisprudence: Dysphoric Bodies of Law (Cavendish, 2002). In terms of trans activism and law reform, she regularly provides advice to government departments, members of parliament, law firms, public interest advocacy organisations, and has been cited judicially in Australia, the United States, and by the European Court of Human Rights. She also serves on the International Legal Committee of WPATH (the World Professional Association of Transgender Health), a law reform body that makes third party interventions in litigation worldwide, and has sat on Amnesty International's Expert Committee on the Criminalisation of Sexual and Reproductive Conduct. In 2010 she published her second monograph, Foucault’s Monsters and the Challenge of Law (Routledge) which followed a series of earlier publications on the subject of Monsters. In theoretical terms, this book represents a shift from the particular (Trans) to the general (Monster) in trying to understand how outsiders are legally and culturally produced and regulated through time. The monster might be viewed as the outsider par excellence. It is this theme of the outsider that connects Alex’s various academic projects and political interventions. Her body of work can be thought of as a kind of outsider jurisprudence. This books deals with recent sexual offence prosecutions brought against young trans and other gender non-conforming people in the UK accused of not disclosing their gender history. It comes down squarely against prosecution.